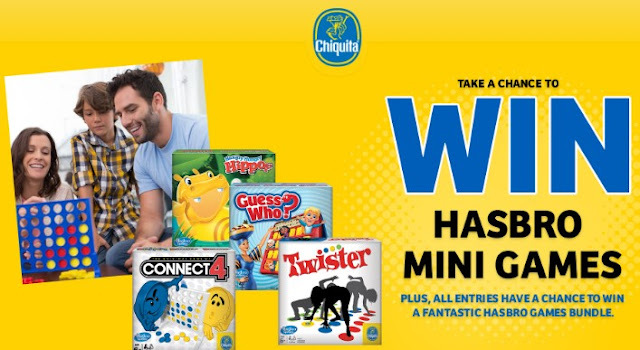 Chiquita Bananas and Hasbro want you to try daily for your chance to win Hasbro Mini Games or a fantastic Hasbro Games Bundle to keep the family fun going all winter long! PRIZES: Connect 4 mini Hasbro game, Guess who mini Hasbro game, Hungry Hungry Hippos mini Hasbro game or a Twister mini Hasbro game worth $7 each or Bop It, Hungry Hungry Hippos, Mouse Trap or Operation prize bundles worth $19 to $44! This Sweepstakes ends on 11/27/16 and you can ENTER EVERY 24 HOURS to win.